1200A test Pulse and set-up of Data Acquisition. Abstract : An experiment with pulses of current is described. The pulses are produced by only one unit of power supply. A simple system of data acquisition is set-up for this experience and for the future diagnostics and control. The objective of these pulses is to asses the capability of batteries to produce high current pulses of moderate length, about 1 second. Find out the internal resistance of the battery and the behaviour at any work regime. The design of the coils will try to match the internal resistance of the batteries. The possibility of two batteries in parallel or 4 batteries in series-parallel will be also analysed. A normal automobile battery is chosen as a first test of the performance of normal batteries to produce pulses of various kA from a few tenths of seconds up to 1 second. Batteries can produce longer pulses than condensers at the same cost but the current is lower. However a longer pulse seems better for a small stellarator with an educative aim because diagnostics and control are far more expensive when the length of the pulse is reduced to milliseconds. Additionally one idea is to build resistive coils in order to work in a similar manner as superconductor coils. Hence a high current and the minimum voltage is required. 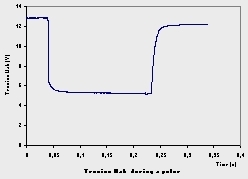 The battery is connected to a steel wire (in general 3 parallel wires) that acts as a power resistor, R1, see Graph 1. Different values of resistance have been experimented. A final measurement without the steel wire is taken to test the battery in short-circuit. 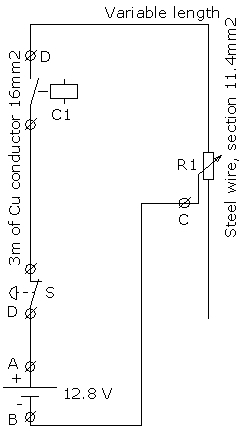 In this case only the 3m length Cu conductor is present. A high power contactor, C1, 3x150A nominal current, is used. 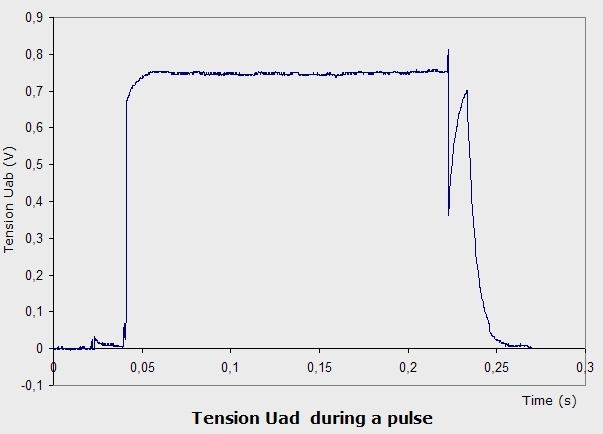 About 3 to 5 times the nominal current can be supposed for a pulse less than 1 second. A kind of manual safety section switch, S, is installed in series with the circuit. Fuses or other safety circuit-breakers are not used due to the diversity of experimental situations. The current is obtained by measuring the drop voltage in R1 that is the voltage Udc and knowing the resistance as an input. The resistor R1 is calibrated in Ohm/metre from measuring and it has enough heat dissipation for the length of the pulse. Several measurements are taken with different values of R1. A simple system based on PC is being developed. At the moment only one A/D card capable of 4 differential inputs is used. One interface box with quality connectors, several voltage dividers and coaxial cables are coupled to the card. Protection against overvoltage is not implemented yet. The same A/D card, from the Berstron brand, has 5 digital inputs. The system is fully extensible to several A/D cards and hundreds of digital I/O. Therefore it should be useful for the control of the stellarator and the data acquisition system. This A/D card is specially featured for sensors using a Wheatstone bridge, thermocouple pressure gauges, temperature sensors, etc. It has 2mV of full scale sensitivity, resolution of 12 bits and max. 50 Ksamples/s. 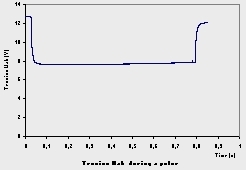 Some results from the measurements are shown in Graph 2. 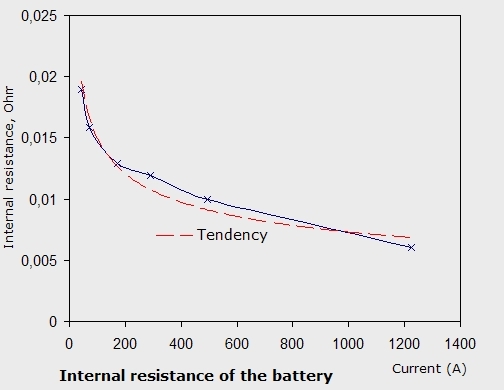 The internal resistance of the battery is calculated supposing an ideal power supply of about 12.8V in series with a resistor. The current in the circuit is measured using the method described above and the voltage Uab during the pulse is known from the A/D card or from a multimeter before the A/D system were operational. The internal resistance decreases up to 0.006 Ohm at the maximum current. The maximum current obtained was 1226 A. However this current will not be reached in the coils of the stellarator if only one battery is used.. The resistivity of the steel wire was measured resulting 1.84 x 10-7 Ohm-m at 30 ºC. The error in this measuring is high, even 10%, due to the low resolution of the multimeter at this range. This measurement will be improved. Other DC current probes will be tested to obtain redundant data. 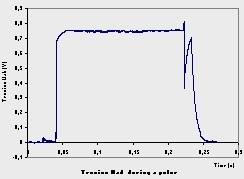 Graph 3 is the voltage drop at the power supply during one pulse produced using 0.5m of steel wire, R1~=0.0086 Ohm. Graph 4 is the voltage at the resistor R1 which is equivalent to the future coils. The power dissipated has a direct relation with the magnetic flux density in the torus. Some losses are observed in the contactor C1 and the Cu lead. 495A and 2100W of dissipated power were measured. The increase in the voltage Udc with the time is mainly due to the heating of the resistor. The final switching overvoltage will be controlled in the stellarator because the inductance is much higher than here. 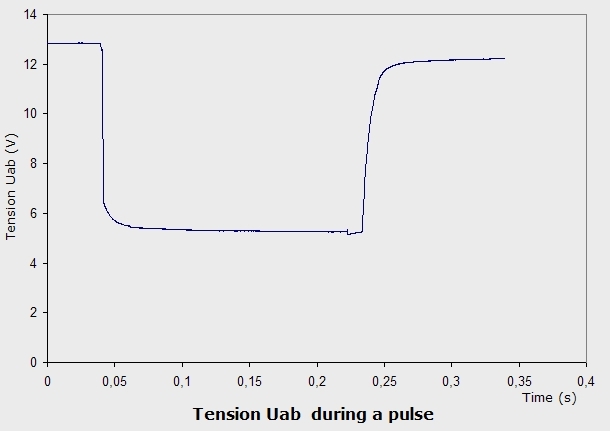 Graph 5 is the result of the short-circuit pulse. Voltage Uad is measured in this case. There is no steel wire. Voltage Uab drops to less than 6V. In Graph 6 some instabilities occurs after opening the circuit. This will be analysed. Certainly this is an extreme pulse that will not happen in normal operation of the stellarator. A current of 1226 A and 4900W in the Cu cable were obtained with only one battery. Improvement of the data acquisition system is necessary, more I/O lines, higher accuracy, less interferences and better calibration. The design of the adequate system power supplies-coils will be carried out. Improve the performance of the electrical operations, discharge resistor, etc. Graph 6 . Voltage Uad during the pulse. Graph 2 . 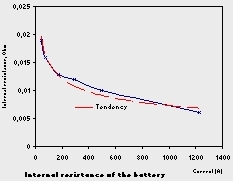 Internal resistance of the tested battery. Graph 3 . 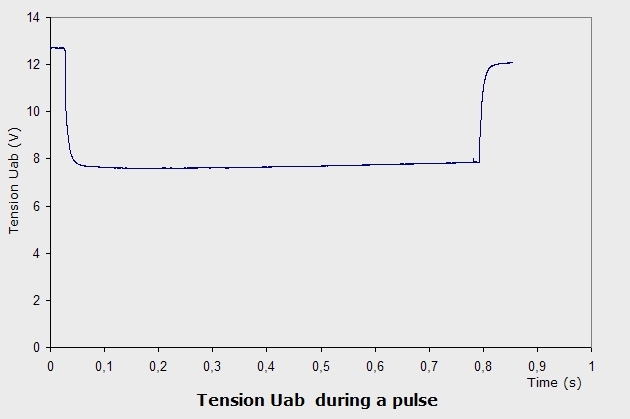 Voltage Uab during a pulse. Graph 4 . 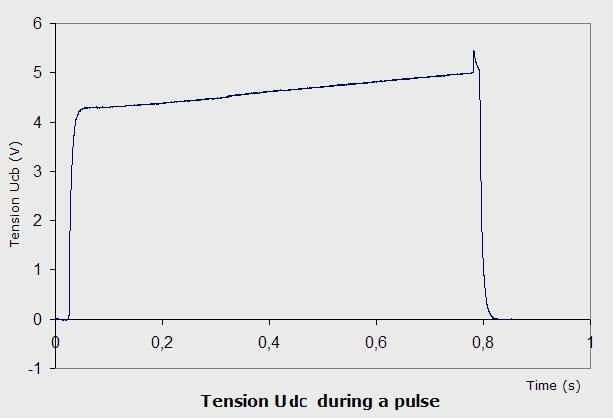 Voltage Udc during a pulse. Graph 5 . Voltage Uab along the pulse. Graph 6 . Voltage Uad along the pulse.